Gnome have a lot of system-wide keyboard shortcuts that have conflict withs application-wide keyboard shortcuts. 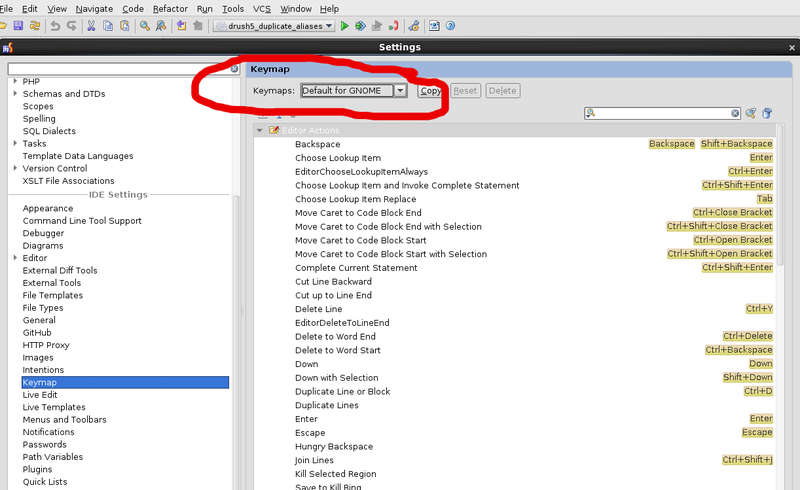 How can I disable all Gnome keyboard shortcuts? Is there any app to map Gnome keyboard shortcuts to super key (or perfectly map to Windows equivalent keys)? Essentially, why do Linux developers not use the super-key as an modifier key for OS-wide actions? An alternate solution to your problem that might be more palatable for you is to change the keymap in PHPStorm to "Default for GNOME". This will change the keyboard shortcut combinations so that conflicts with GNOME are removed. I believe PHPStorm installs with "Default for XWin" as the default keymap, which includes shortcuts keys like Alt+F8 and Alt+F9 that conflict with GNOME window Window Management keyboard shortcuts. Ubuntu 11.04 ships by default Unity. It also ships GNOME 2.32 (named 'GNOME Classic' when you want to start the session). You set the 'Compose' key by mistake in a different key. Go to System-Preferences-Keyboard-Layout and choose the button 'options'. The customizations are in bold. You set it manually (or by mistake) in the global binding. Go to System-Preferences-Keyboard Shorcuts. Go to System-Preference-Appearance-Visual effects and set it to None. The keybinding should change. Edit your question and change 'GNOME' by 'Unity'. Not the answer you're looking for? Browse other questions tagged linux ubuntu gnome shortcuts or ask your own question. How can I type a backslash with no backslash key? Linux: What is stealing my keypress combination?